WHAT IS CAUSING THE LIGHTS ON CERES? Lights on Ceres - An Unexplained Natural Phenomenon, Or a Sign That We Are Not Alone? Updated 1/3/2018. Ceres is a dwarf planet located between Mars and Jupiter. It has an equatorial diameter of about 601 miles and a polar diameter of about 556 miles. NASA has asked for help in explaininig strange lights coming from it at the Occator Crater. It has been said that ice, salt flats, ice, volcanoes or geysers seem to be the predominant theories at the moment, with the bright spots appearing to reflect incoming sunlight towards the spacecraft's cameras. On June 29, 2016 JPL released a study that indicates the crater has the highest concentration of carbonate minerals (mostly sodium carbonate) ever seen outside Earth. It has a central pit about 6 miles (10 kilometers) wide with a dome structure at the center, covered in highly reflective material, that has radial and concentric fractures on and around it. Sodium carbonate is a kind of salt found on Earth in hydrothermal environments. They claim the material appears to have come from inside Ceres, because an impacting asteroid could not have delivered it. However, one crucial topic is not addressed in the press release. Was any attempt ever made to photograph the crater when it was in the dark as the Dawn spacecraft orbited it? If what we are seeing is a reflection of sunlight, it should vanish when the sun sets. But the light appears all the way across Ceres from when it first appears on the left limb to the time it disappears on the right limb. Further at the limbs there is no evidence of outgasing that appears. More people select "other" as the cause. It's still not entirely clear that these lights are not due to built structures. Animated Figure 1 above shows a sequence of images taken by Nasa's Dawn spacecraft on May 4, 2015, from a distance of 8,400 miles (13,600km), in its RC3 mapping orbit. The image resolution is 0.8 mile (1.3km) per pixel . Note that on the time-lapse view below the lights in the crater when it reaches the right limb of Ceres only go invisible when the walls of the crater obscure them. This again speaks to the fact that the lights are not reflections of the sun. Instead they are originating in the crater. Since the period of rotation of Ceres is about 9 hours 4 minutes, and since the Dawn spacecraft has been in orbit around Ceres from March 6, 2015, there should have been plenty of time to photograph the 50-mile wide crater that contains these lights while the crater was turned away from the sun. Dawn was orbiting Ceres every 3.1 days when the Animated Figure 3 was made, however when the photo in Figure 34 was taken, Dawn was down to 915 miles above series which it orbited every 19.1 hours. In Ben Bova's Sci-Fi novel New Earth astronauts visit a world that looks something like Earth. When they arrive there and enter orbit they are astounded to find a light shining up at them from the planet's night side. Ceres does not look like Earth, but it likely has a liquid water ocean lying between its rocky core and icy mantle (Rivkin et al. 2006) with more fresh water in it than we find on all the Earth. Obviously, if nothing else is true, Ceres would make a great space station. That we have heard nothing about the attempts to image the lights when it is night seems strange. If the lights are seen when Ceres is not facing the sun the chances rise significantly that the anomaly has an intelligent origin. Indeed, Figure 26 seems to suggest that the lights will persist when it is dark. There is a basic problem with NASA's discussion of the lights. Rather than give us a coherent explanation of what the lights are, they are asking the public for our opinion. This may seem OK, however the problem lies with the choices that we are given. Figure 34 below shows the latest photo taken from an altitude of 915 miles. As of October 19, 2015 the public has voted for ice (backed by 28%), volcano (10%) salt deposit (11%), geyser (6%), rock (6%) and "other" (39%). What can't they simply offer alien life as a choice? That they don't want to go there is reminiscent of the mocking attitude often displayed toward people who report UFOs. The very nature of the questionnaire may indicate that NASA is looking for an excuse for the lights that will be most plausible to the public. At least they have not suggested swamp gas. 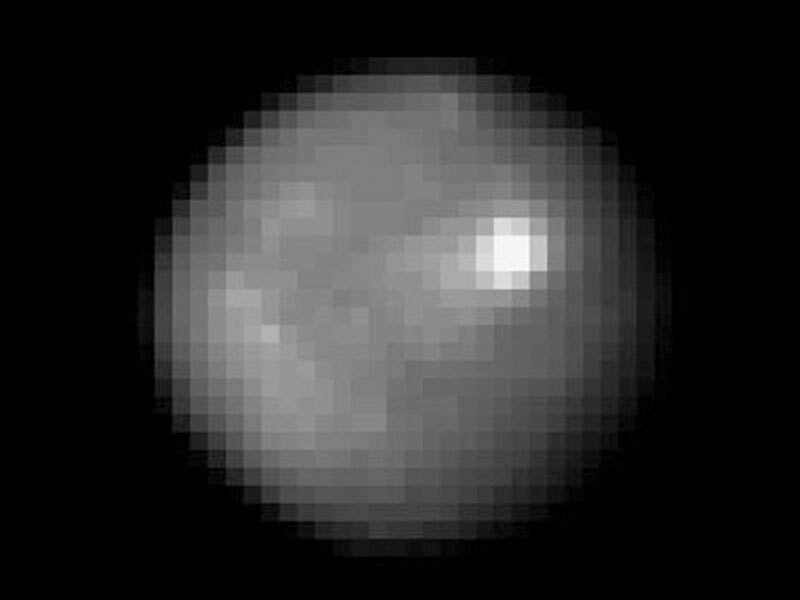 As for their approved choices both ice and salt flats should not be so bright when viewed near the limb of the dwarf planet. Volcanoes should have plumes going up into space and deposits around them. These are not seen on the photos. Geyers should display plumes too (again, not seen). There is no known reason why rocks should be so bright. So the plurality of people are right to reach for "other." However, "other" might also include diamonds that might have been formed with an asteroid impact, or that might have been transferred there as a result of an impact on Jupiter or elsewhere. Arthur C. Clark's Sci-Fi novel, 2061: Odyssey Three was based on a such an object being found on Jupiter's moon Europa. There are theories that it actually rains diamonds on Jupiter and Saturn. Internal reflections might help the light to be seen at the limbs of Ceres. Further, diamonds are associated with the Popigai impact crater in Russia. The site of the bright lights on Ceres is an impact crater. Note: If the Government knows that there are trendendous quantities of diamonds on Ceres they would probably not announce it now simply because it would radically drive down the value of diamonds and destroy the wealth of many powerful people. Figure 33 below - lights in the left terminator. THE LIGHTS ON CERES ARE NOT NEW. Figure 35 below was taken from an Earthfiles News video put out on June 18, 2015. The film includes an interview with the Dawn Principle Investigator, Dr. Christopher T. Russell. Among several items of interest on the film is that although the Dawn Spacecraft was launched in September 27, 2007, the tremendous light coming from this area on Ceres was actually first seen by the Hubble Space Telescope in 2004. Dr. Russell indicates that when Dawn reaches the lowest orbit (230 miles) the camera resolution will only allow us to see an area of 40 meters by 40 meters per pixel. This is because NASA did not choose to fund a better camera. There is a reference to some of the lights forming an equilateral triangle, but the pictures taken are not convincing of this assertion. The film does not discuss why there are no pictures taken when the crater was in darkness and the Dawn spacecraft was over it on its orbit. JPL states that, "views from Dawn's current orbit, taken at an altitude of 915 miles (1,470 kilometers), have about three times better resolution than the images the spacecraft delivered from its previous orbit in June, and nearly 10 times better than in the spacecraft's first orbit at Ceres in April and May." They offer the video below to give us a better picture of the geology of the Occator crater. For details about the video see http://www.jpl.nasa.gov/spaceimages/details.php?id=pia19890. Figure 34 below - The lights as seen in September, 2015 from an altitude of 915 miles. Figure 35 shows that the lights on Ceres have been present for at least a decade. Marc Rayman, Dawn's chief engineer and mission director based at JPL in Pasadena, states, "Dawn has transformed what was so recently a few bright dots into a complex and beautiful, gleaming landscape. Soon, the scientific analysis will reveal the geological and chemical nature of this mysterious and mesmerizing extraterrestrial scenery." Nathues and colleagues, using images from Dawn's framing camera, suggest that these salt-rich areas were left behind when water-ice sublimated in the past. Impacts from asteroids would have unearthed the mixture of ice and salt, they say. The presence of ammoniated compounds raises the possibility that Ceres did not originate in the main asteroid belt between Mars and Jupiter, where it currently resides, but instead might have formed in the outer solar system. Another idea is that Ceres formed close to its present position, incorporating materials that drifted in from the outer solar system - near the orbit of Neptune, where nitrogen ices are thermally stable. "The presence of ammonia-bearing species suggests that Ceres is composed of material accreted in an environment where ammonia and nitrogen were abundant. Consequently, we think that this material originated in the outer cold solar system," said Maria Cristina De Sanctis, lead author of the study, based at the National Institute of Astrophysics, Rome. Dawn's mission is managed by the Jet Propulsion Laboratory for NASA. Dawn is a project of the directorate's Discovery Program, managed by NASA's Marshall Space Flight Center in Huntsville, Alabama. UCLA is responsible for overall Dawn mission science. Orbital ATK Inc., in Dulles, Virginia, designed and built the spacecraft. The German Aerospace Center (who, with IP address 129.247.31.224 on December 8, 2015, the day of this JPL update, last visited in reference to Dr. Gilbert Levin's life detection experiments on Viking 1 and 2), Max Planck Institute for Solar System Research, Italian Space Agency and Italian National Astrophysical Institute are international partners on the mission team. COMMENT BY THE ROFFMAN TEAM ON DEVEMBER 30, 2015: JPL is still asking the public for our opinion about what the bright spot is. Of note is that as of this date they have not commented about what the crater looks like when it is in darkness. Is any light still showing then? Arizona State University scientists have proposed that the bright spots are best explained as resulting from briny water erupted from Ceres's interior that subsequently sublimated, leaving behind only the salt deposits. Near-infrared spectra of these bright areas are consistent with a large amount of sodium carbonate, (Na2CO3) and smaller amounts of ammonium chloride (NH4Cl) or ammonium bicarbonate (NH4HCO3). These materials have been suggested to originate from the recent crystallization of brines that reached the surface from below. Researchers think that they have now found through crater counting that Occator crater is all that remains of the central mountain from an impact 34 million years ago. The bright material is only 4 million years old, and cryovolcanism may not have stopped completely as there is evidence of a thin haze, observed through variation in brightness, still present today, thought to be due to sublimating ice. Ice would not last long in such warm conditions exposed to the vacuum of space, so that would suggest it is being brought to the surface to this day. Dawn's closest orbit around Ceres is at a distance of 375 km (233 mi), started in early December 2015. This low-altitude mapping orbit (LAMO) is designed to acquire data for at least three months with Dawn's gamma-ray and neutron detector (GRaND) for gravity investigation and to determine the chemical composition on and near the surface. As of September 2017, Dawn remains operational and orbiting at 28,700 km above Ceres. COMMENTS: We have yet to find any discussion of what was seen when the brights spots were on the dark side with Dawn looking down from above.